بني في 1986, فندق فور بوينتس شيراتون بيرث هو ميزة مُضافة لـ برث و خيار ذكي للمسافرين. إن موقع الفندق الاستراتيجي، الذي يبعد 0.5 Km فقط عن مركز المدينة، يسمح للنزلاء بالوصول سريعاً وبسهولة إلى العديد من الوجهات المحلية المثيرة. يشكل هذا الفندق ملاذاَ مريحاً للاسترخاء ويمنح زواره فرصة للاستجمام والتجدد، وهو يقع على بعد خطوات من المعالم السياحية الكثيرة للمدينة كمثل: ‪Perth Arena‬, ‪Barracks Arch‬, Watertown Brand Outlet Centre. يعرف Starwood Hotels & Resorts Worldwide بالمستوى الراقي لخدماته ولباقة موظفيه، وهذا ما ستجده في فندق فور بوينتس شيراتون بيرث. يقدم هذا الفندق العديد من الخدمات الكفيلة بإرضاء أكثر الضيوف تطلباً. ادخل إلى واحدة من الغرف 278 وتخلص من عناء نهار طويل بمساعدة مجموعة كبيرة من الخدمات كمثل تلفزيون بشاشة مسطحة, كاشف دخان, غرف لغير المدخنين, مكيف هواء, تدفئة الموجودة في بعض الغرف. كما أن مجموعة الخدمات الواسعة الموجودة في الفندق لضمان راحتك تترك لك الكثير من الخيارات لقضاء وقتك أثناء فترة إقامتك. يحظى فندق فندق فور بوينتس شيراتون بيرث بموقع ممتاز وخدمات يصعب منافستها. 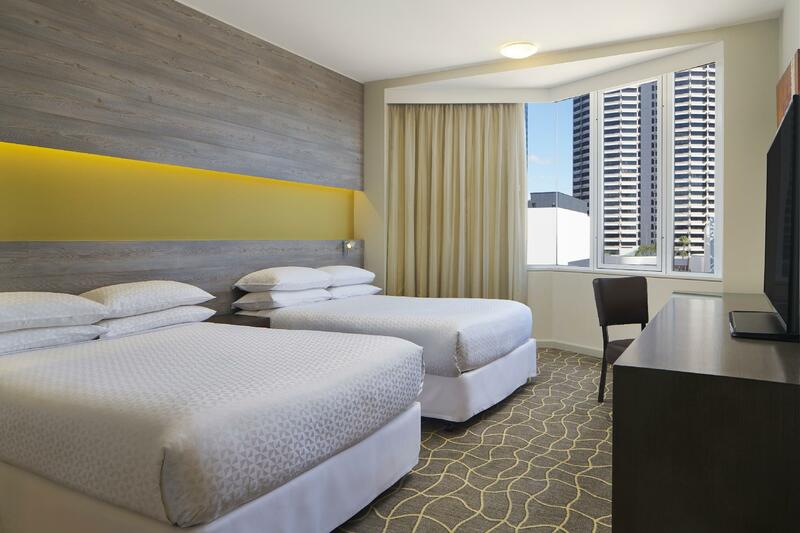 يُرجى العلم بأن فندق "فور بوينتس باي شيراتون بيرث" (Four Points by Sheraton Perth) يطلب تفويضًا لحجز مبلغ مسبق من البطاقة الائتمانية لسحب رسم أو دفع مبلغ تأمين نقدي عند تسجيل الوصول لتغطية أية مصروفات عرضية لكل يوم من أيام إقامتك. يُرجى العلم بأنه لا تنطبق نقاط "ضيف ستاروود المفضل" (SPG) على الغرف المحجوزة على هذا الموقع، ولا يتم احتساب الإقامة كنقاط للوصول إلى فئة النخبة. تُفرَض رسوم إضافية عند استخدام بطاقة ائتمان أو خصم، وقيمتها كالتالي: 2,9% لبطاقات أمريكان إكسبريس، وداينرز، وجيه سي بي، و1,1% لبطاقات فيزا، و0,8% لبطاقات ماستر كارد. Its central to everything just on the outskirts of the Perth City yet close to everything in the Central. Good clean rooms with great breakfast. What else can I say? It is after all a Sheraton so you can't go wrong with the brand name. Will definitely stay here again next time in Perth. 1. Basic guest amenities ie tooth paste, tooth brush, shower cap, shaver, kettle, drinking bottle etc are not provided 2. Windows are not sound proof so typically you can’t sleep well because you heard all sort of sound that came from main road. 3. I was given a disable friendly room, but room layout and it’s bathroom design may not suit to normal people. The hotel was nice, comfy bed and really clean. The downside was when we booked we thought breakfast was included as it stated on the app (which I showed to them on my phone) but when we checked in they said it wasn’t included and to go through Agoda to sort it out. The room was a good size (plenty big enough for 2 adults + 1 child) and very clean. Staff were extremely friendly and helpful, location is very handy for all the cafes and restaurants of Yagan Square, Northbridge and the CBD as well as walking distance to King's Park. Recommend. As my flight was delayed, we arrive the hotel around 5PM. I have already called the hotel staff by phone for this check in time change due to this accident. When we arrived the hotel, the staff (a man with black skin color, not discrimination, only want to describe the guy) is not polite at all. He kept showing his unpleasant attitude to us. He said nothing then passed to another staff to serve us. He went to serve others instead. The another staff then helped us for checking in for more than half an hour... saying that they needed time as we checked in in the morning which was the same as check out day... we have told the hotel already for this special arrangement at least 9hours... I don't understand why treated us like we did something wrong.. especially the first staff. He was very impolite! We moved here from another highly regarded chain after two nights and the difference was significant. Great location opposite Perth arena with free CAT bus stop 2 mins walk away. Easy walk to main shopping streets and malls. Plenty of dining options outside hotel. The room housekeeping was of impeccable level and deserves the mention here. We are going back for a week after a week touring Margaret river area. The staff were very helpful in making sure our stay was pleasant and also provided advise on private airport transfer which was comfortable and cost the same as shared coach transfer originally arranged by the travel agent. Thank you Four Points! The Property is clean and in good location. We are very delighted that the twin sharing room is spacious, and comes with 2 units Double Bed which are very comfortable. Walking distance to Hay Street mall and Kings Park. Fantastic location that is not smack in the middle of the hustle and bustle but yet a short walk to the major stores like Myers and Perth Train Station. There is a CAT stop right in front of the hotel. I particularly appreciated the staff allowing us to check in early at 8am as we arrived from an early flight. The front desk staff and concierge were very friendly and helpful. The location is pretty central so you can walk to the city centre. The only downside is breakfast - I would recommend getting breakfast outside. Upon checked in, my kids received "educational gifts" from the hotel. They were so happy. Later, when we enter the room, received surprise Birthday Halal Chocolate for my hubby birthday. Thanks for doing extra miles to provide Halal Chocolate for muslim guest :) Excellent service. Keep it up! Whenever we travel, we will be very particular with the cleanliness of our room toilet. We will give 🌟🌟🌟🌟🌟 for the room toilet. It's exactly the same as the pictures review we saw online, clean and well maintained. 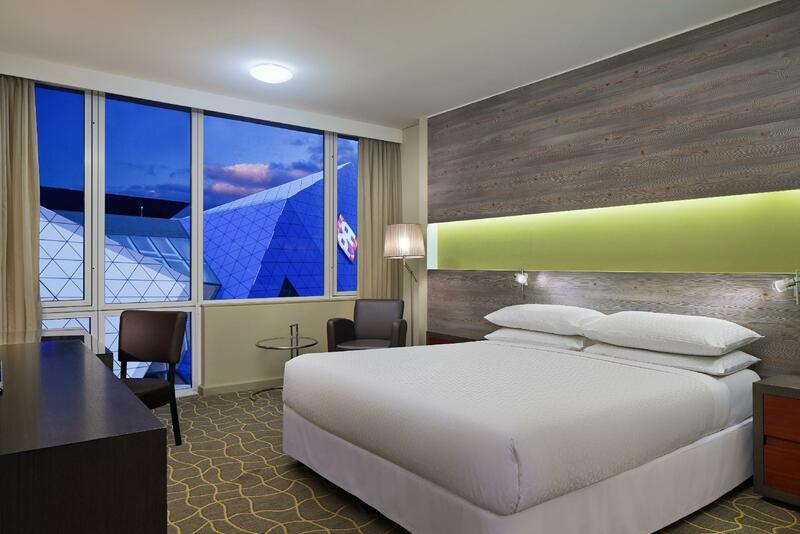 because of Christmas, got a very cheap price for the room Good location, walk distance to kings park/esplanage station/perth station. receptionist girl seems not happy to work during Chiristmas:D, but the room cleaner works very well. 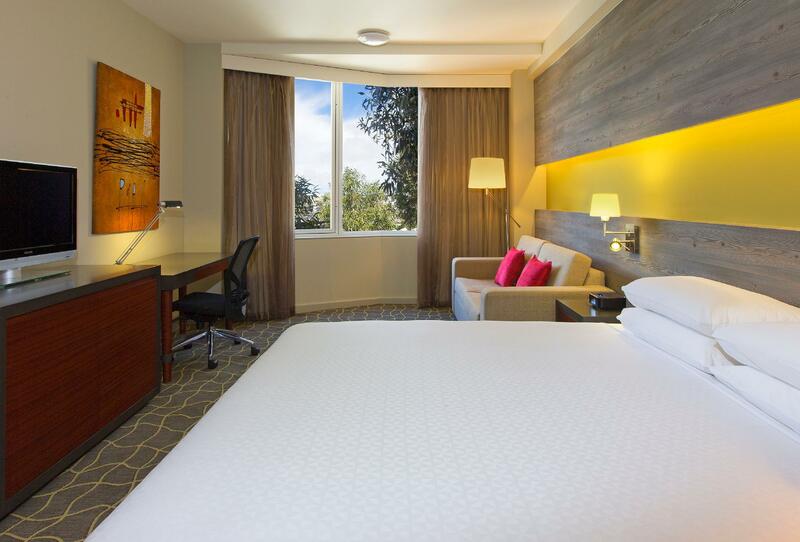 because of Christmas, got a very cheap price for the room Good location, walk distance to kings park/esplanage station/perth station. Food is good, but charged 1.5% for credit card usage without notice. receptionist girl seems not happy to work during Chiristmas:D, but the room cleaner works very well. Firstly, the front desk personnel are so good, kind, friendly, and helpful. I must mentioned the name of front desk manager, Yann who gave us the warmest greeting and most helpful guidance to the direction of route. Yann gave us the most welcomed way of hotel staying experience and we're so happy about it. Though we were not able to say " thank you" to Yann at the day we checked out as he was on leave, but I would like to show him our appreciation here. Thank you very mcuh Yann, your service and kindness are way much better than the 5 stars regency hotel I stayed aafter I checked out Sheraton! Other than Yann, front desk personnel liek Chris and Abel were kind enough to answer everything we asked eg: tour information, route direction and so on. Thank you very much. The breakfast was awesome too the fruits are delicious. 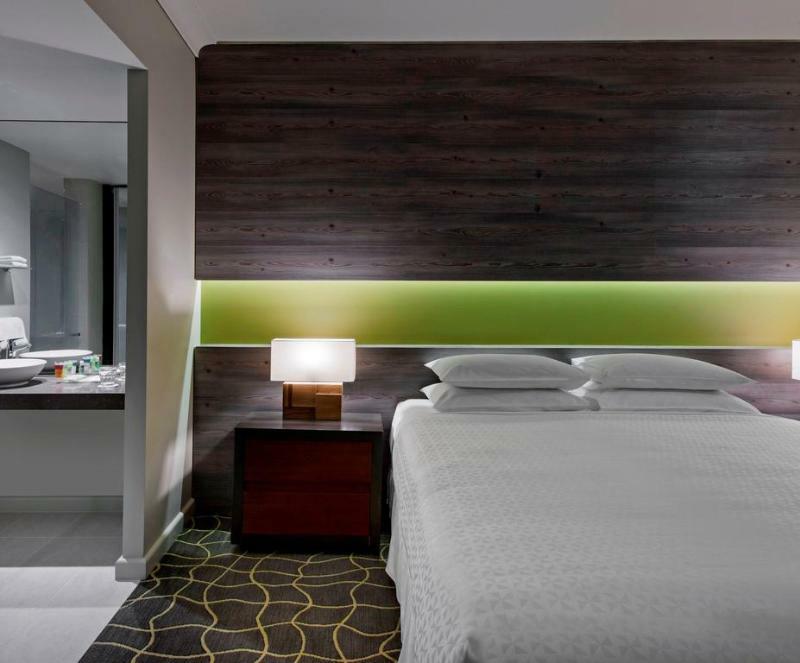 I had a very bad experience in 5 stars regency after I checked out sheraton, I would say the front desk personnel in Four Points by Sheraton Perth worth more than 4 stars!Thank you !